My son came home with this cute egg craft from his playgroup this morning, so I thought I'd share it (my friend Chrissie is the artistic brains behind this one). It is similar to many of the other collage projects we've done for other holidays and is nice and simple! Materials Needed: construction paper cut into an egg shape, glitter, Elmers glue, textured objects to attach (feathers, pom poms, beads, etc.). 1. Nice and easy- add some glue to your egg and start sticking things on!! My son was especially proud of the wooden bead he used. 2. Let it dry and display it! I typically hate using glitter, so I always love it when my son gets an opportunity to use it at someone else's house! After many years of teaching where the custodians begged me not to use it, I only use glitter glue pens now... unless we are crafting outside... and even then I hate it. Am I a terrible mom? PS- Have you checked out the Easter Relief Painting at No Time For Flashcards yet today? 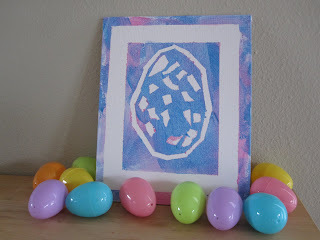 It is seriously my favorite Easter craft that I've seen lately. I am going to try it out with my little guy later this week! I'll let you know if we make any adaptions. Have you done an Easter collage with your students/kids? What are their favorite things to stick on?